Second Serving Green Can Be So Good! SERVING SUGGESTIONS: This salad works with lots of different meals - or as the meal! Personally I love it with grilled veggies and tofu but it also can stand up well to meatier main dishes. Pretty much everyone in my family, from age 3 to 93, loves this salad - it has even become a holiday tradition at our gatherings! I don't wait for special occasions though, I make this whenever I'm craving greens or hoping to open a spinach-hater's heart. 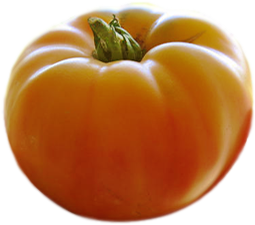 This recipe is an adaptation from Edward Espe Brown's version in his book Tomato Blessings and Radish Teachings. 1 apple, I like to use a pink lady or Fuji, but any favorite is great. 1-2 cloves of garlic, minced or pressed, more if you love it! Roast the almonds for 7 to 8 minutes in a 350° oven, or pan-roast on top of the stove until crunchy when chopped. 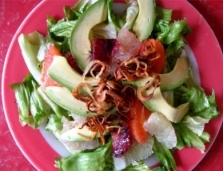 To make the dressing, combine the cumin and coriander with the lime juice, salt and honey. Check the seasons to see if you want a pinch more of anything, keeping in mind that it will be less intense once it's combined with the olive oil. 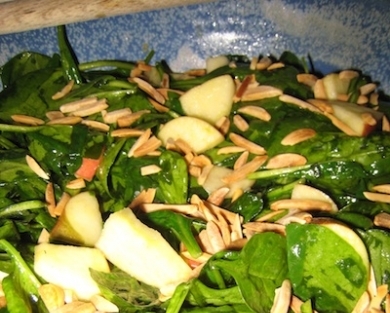 Cut the apple into thin slices or small pieces and toss with the dressing. 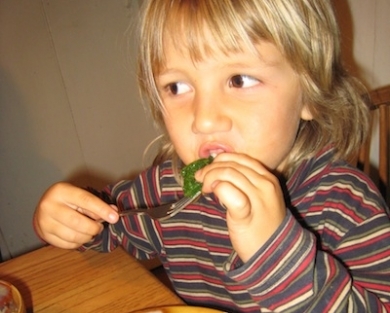 Put the spinach into a large non-plastic bowl. Heat the olive oil in a small pan until nearly smoking. Carefully, and slowly, pour the hot oil over the spinach while tossing the spinach around - tongs work great, an extra pair of hands also is very helpful! If you prefer your spinach more wilted, press clumps of it back into the hot oil pan. 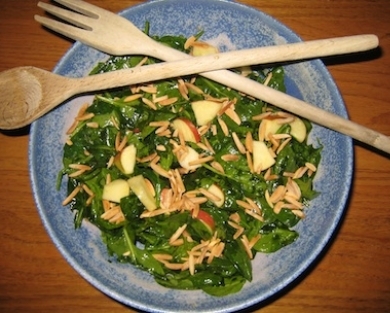 When it's wilted to your preference, toss the dressing and apples with the spinach, garnish with almonds and serve.